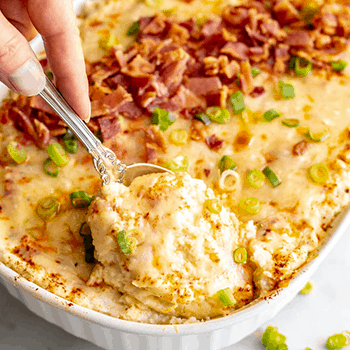 Mashed Cauliflower Casserole is loaded with cream cheese and cheddar cheese and served with bacon and green onions. This easy recipe is a perfect low-carb side dish! The mashed cauliflower is so smooth and creamy, so rich and tasty, and is just over-the-top with the bacon and green onions sprinkled on it. I literally go back for a huge spoonful of seconds. I kind-of can’t be trusted around this cauliflower side dish. It’s so addictive! As far as cooking with dairy goes, I love using nonfat Greek yogurt in recipes to lighten things up but also add a punch of protein to make the dish more filling. Cream cheese is another great way to lighten recipes up without sacrificing flavor. I use cream cheese and Greek yogurt in my mashed cauliflower potatoes because I like the soft smoothness of the cream cheese and the tanginess from the Greek yogurt. And you certainly won’t be missing the carbs from regular potatoes. Maybe that’s why I go back for more and more of this… it just doesn’t weigh you down like regular mashed potatoes. Looking for more low-carb sides? For a healthier take on traditional sweet potato casserole, try Cinnamon Maple Greek Yogurt Squash Casserole, and use Greek yogurt to lighten up this creamy Pumpkin Mac and Cheese. Place the cauliflower florets in a steamer basket in a pot with water, cover the top, bring to a boil and steam for 10-15 minutes, until very tender. The exact time will depend on the size of your florets. Drain the cauliflower well and pat dry. Transfer the steamed cauliflower to a food processor (you may need to do this in batches.) Add the cream cheese, Greek yogurt, butter, salt and pepper and process until smooth. Add 2-4 tablespoons of milk, as needed, to get it to come together and get the right consistency. Taste and add salt, pepper and more butter if needed. Stir in 1 cup of the shredded cheddar cheese. Transfer the mixture to a 1 ½-quart baking dish that’s sprayed with cooking spray (or brushed with melted butter, if you prefer). Smooth the top to make it even, then sprinkle with the paprika and the remaining cup of cheddar cheese. Bake at 350°F for 10-15 minutes, until the dish is warmed through and the cheese is melted. Top with the cooked, crumbled bacon and sliced green onions. Serve hot and enjoy! Notes: Pat the cauliflower dry with paper towels or a dish towel after they’ve steamed so you don’t have watered down mashed cauliflower. The bacon for this recipe needs to be cooked, so please plan accordingly. Feel free to substitute sour cream or extra cream cheese for the Greek yogurt if you don’t have any on hand. Finally, you can prep this casserole ahead of time by assembling it in the casserole dish and refrigerating until you’re ready to go. Let it come to room temperature and bake as instructed, or bake an extra 10 minutes if coming straight out of the refrigerator. 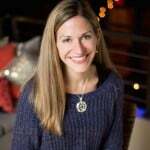 Kathryn is a health and nutrition editor, wife, mother of two little kids and a devoted food and home cooking nut. She has lots of easy recipes and resources that she shares on Family Food on the Table to help you get delicious family food on your table!